Unique Designer Hats, Purses, and So Much More! DDA Hats & Fashions of 8709 La Tijera Boulevard of Los Angeles, California 90045, carries a full line of truly unique, casual and dressy designer hats for all occasions. We also have furs, jewelry, purses, and suits that are current and elegant. Embark upon the shopping experience of a lifetime at our boutique or shop with us online. We have more than 25 years' experience and carry over 200 different hats at any time. We also keep just as many designer knit suits, in sizes 2 through 28, in stock. Find incredible jewelry and purses to die for. No matter your destination or event, we have what you want at an affordable price. different. It is currently priced at $299.50. This is a Mary Frances purse shaped like a painter's palette with brush and paint colors. The Painters Palette purse is great for the artist or art aficionada you know. It makes a great conversation piece. It is currently priced at $284.50. 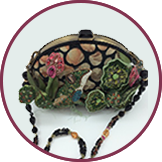 This charming purse from Mary Frances is very unique and is embellished with a frog and lily pad design. 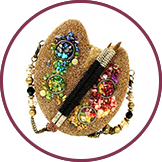 The Prince Charming purse is beaded, includes rhinestones and is definitely a good luck bag. It is currently priced at $284.50. 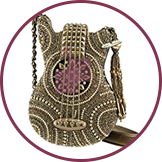 This Mary Frances purse is shaped like a silver studded, rhinestone guitar. 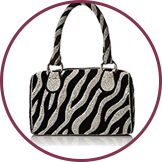 This elegant handbag certainly makes a fashion statement and goes well with any number of ensembles. It is currently priced at $294.50.